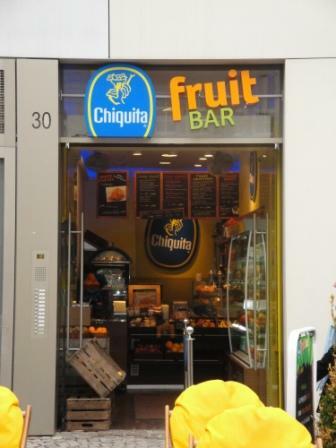 How About We Take The Chiquita Sticker Into The High Street And Stick It On The Front Door? What Else Could We Sell Our Adoring Public? Particularly In Winter? 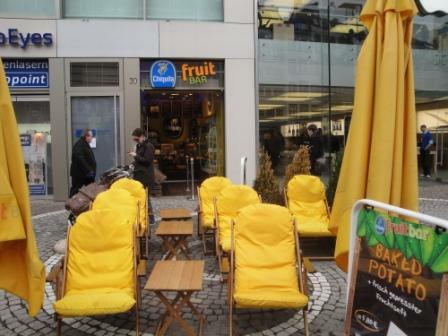 And If We Provide Some Nice Bright Yellow Chairs, We Might Even Sell Some Bananas For Dessert! Nevertheless, success can be sweet. I wonder how long the potato grower queue is who want to discuss supply agreements with Chiquita!? 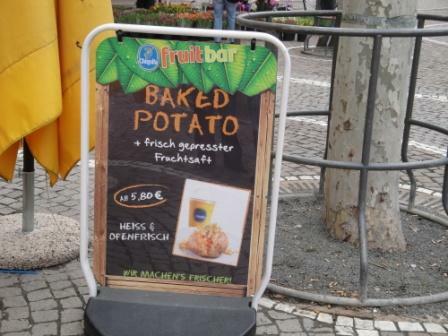 Posted: February 20th, 2011 under Bananas, Germany, Produce. 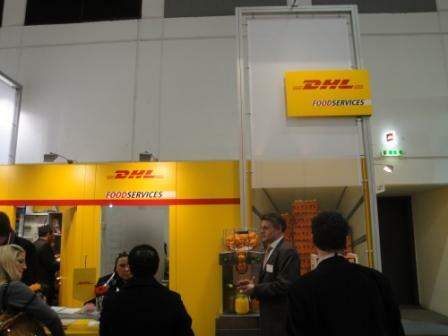 One knows the world is changing rapidly when an outfit like DHL decides to take one’s industry serious and not only exhibits but also goes as far as subbranding its acronym with something us peasants are meant to understand – like food services, for example. 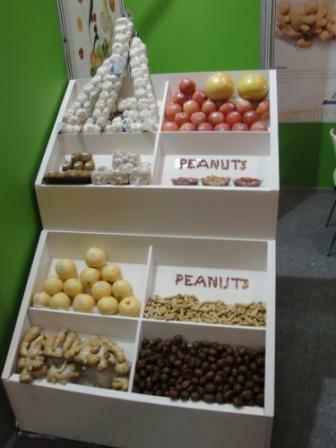 Someone on one of the Chinese stands decided that us Gweilos don’t recognise a peanut when it is still in its shell. He turned this concern into some action. Isn’t it amazing what we can see and find when we walk with eyes wide open through a crowd? Posted: February 11th, 2011 under Produce. 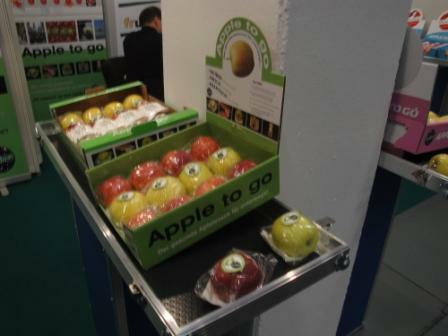 One can’t fail to be impressed by Fruit Logistica. The scale of this show is something else altogether. 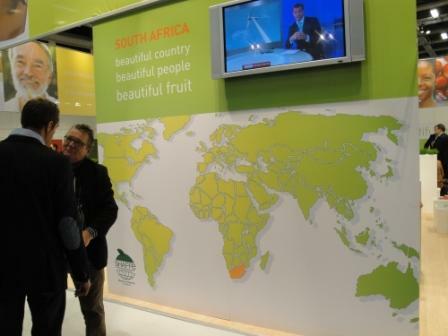 If one really wants to understand the scope and depth of the fresh produce industry one needs to have at least once been pounding the exhibition floors here. 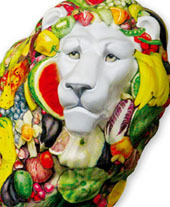 There is no way that this humble blog is able to cover the entire operation but we will get around to sharing some of the high lights with you – and in order to have some sense of order (that is the German coming out in me), we will discuss Fruit Logistica by theme. Let’s start with apples. Does the world still eat apples? Sure does. Are there plenty of apples around? Sure are. Is there much innovation? Well, that depends what one considers to be innovation. 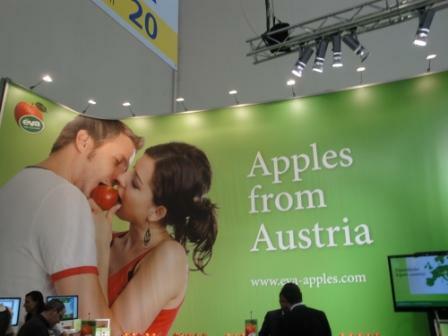 There is little innovation in the “Me Tarzan, you Jane” approach practiced by the Austrian apple sellers brigade. Just as I was going to give up on finding some apple related innovation I hit the jackpot. Innovation at last. Apples To Go. A picture speaks a thousand words, doesn’t it just? There were other pockets of apple innovation. They are lurking amongst the print material I collected on my rounds, waiting to be sorted, scanned and reported upon eventually. In the meantime, which of these three apple marketers would you consider investing in? Posted: February 10th, 2011 under Produce. Fruit Logistica beckoned and here I am. IFPS, the International Federation for Produce Standards is running its first Global Forum tomorrow, so I will be quite busy for the next three days. I like to combat jet lag by walking through town on the first day, to get my bearings, to observe and to get the old mind working so that sleep will come when it is called for and not at eleven o’clock in the morning. Herewith a photographic record of some of my finds. Berlin being the metropolis it is cannot afford for all of its citizens to live on quarter acre sections. The majority of Berliners therefore dwell in multi- storage housing blocks, some with Hinterhoefe, some built in Kaiser time, some built by the Communists and some relatively new. 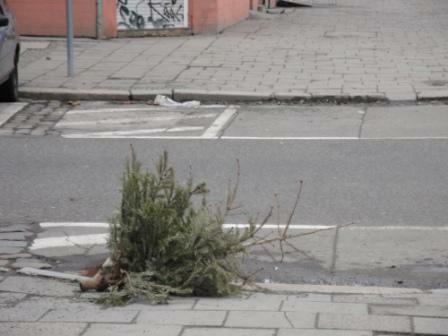 One common habit that can be found in the vicinity of all is that when Christmas is over, the now surplus to requirement tree gets unceremoniously dumped from the balcony down onto the pavement, in the vain hope that that the boys from the municipal rubbish collection will come and clean up. Clearly, there is a bit of a problem with that when the trees are still lying around the street in early February! 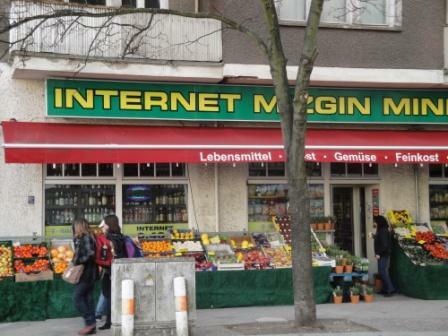 Still pondering what had happened to people who went walking through Berlin on, say, 6th January, the day Christmas trees traditionally get taken down thrown down the balconies and I come across this Turkish greengrocer. Or is he? How does one describe a retailer who is open 24 hours, sells every hard liquor type one can possibly think of to anyone who has the right money, runs an Internet cafe and, last but not least, offers quite a respectable range of fruit and vegetables right outside the store around the clock? Whatever one calls him, he is clearly a man who goes with the time. Pity though that Mrs Greengrocer is still in the back of the store bagging the onions, that the granny is operating the till and the daughters are merchandising the store whilst the Pascha stands outside, smokes his cigar and is satisfied with his days work. Posted: February 9th, 2011 under Conferences, Consumer, Germany. The latest edition of Fruchthandel arrived on my desk today. 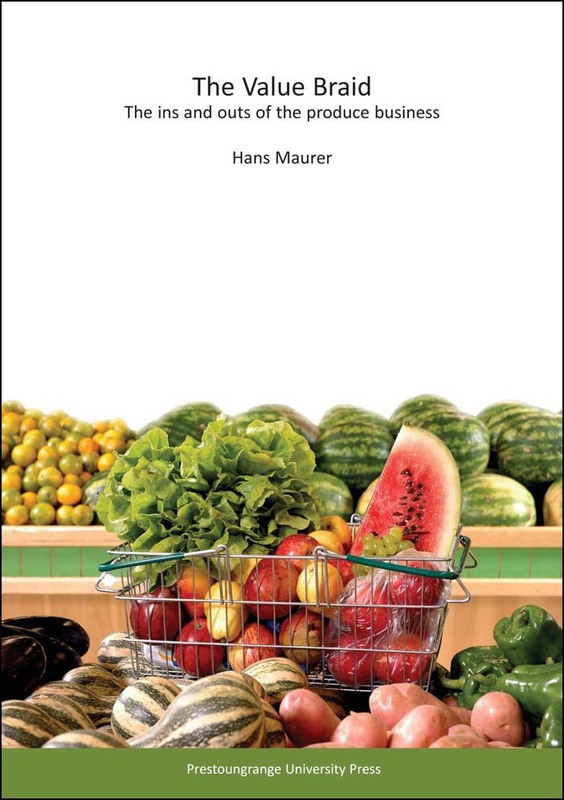 As the magazine is aimed at the German fresh fruit & vegetable trade the articles it contains are inevitably written in the language of that country. Quoting from an article is therefore not as simple as scanning in a page but it involves engaging the grey matter some translation which is why I rarely get around to discuss what I read in that magazine. I need to make an exception though. My eye caught a column contributed by one Marcus Niebisch. Mr Niebisch works for Munich based produce wholesaler Zelger GMbH, and sits on the board of the Deutscher Fruchthandelsverband e. V., the German Produce Merchants Association (English website version available). Here are a few gems from his column in which he discusses the state of the produce wholesale trade in his country vis-a-vis retailers and consumers. I have taken the key statements made and lined them up. The underlying message revolving around these sound bites is that the position the German wholesale produce trade finds itself in appears to be not sustainable, so non-linear solutions are needed. If nothing else, here is confirmation yet again that the world has become a global village and what we might perceive to be a unique problem only applying to us is in fact generic and is present everywhere. Posted: February 3rd, 2011 under Consumer, Germany, Industry Politics, Produce.